One of the biggest changes in college hoops over the last 10 years has been the rise of several consistently strong mid-major programs to the status of legitimate national title contenders. George Mason first crashed the Final Four party in 2006 with a gutsy, emotional Elite Eight win over #1 seed Connecticut. That paved the way for the rise of Butler (2010, 2011), VCU (2011), and Wichita State (2013), each of which were led by dynamic young coaches building winning programs. Throw in the likes of Gonzaga, San Diego State and Xavier, and the growing parity brought with it added competitiveness and a widening of the NCAA hoops pie. But this year is all about the blue-bloods. Kentucky, Duke, Indiana, Kansas, North Carolina and UCLA are all in the AP top 10 for the first time since 1994. While some of those schools have maintained relevance over the intervening seasons, the simultaneous rise of the Hoosiers and Bruins augurs a shift back to the traditional power programs. The “why” for this trend could very well be recruiting. Kentucky’s John Calipari was the first coach to truly embrace the one-and-done model of recruiting. The theory is basically that if you can gather the most talented players in the country — regardless whether all of them will be headed to the NBA after just one season — you should. Yes, there are challenges with youth, inexperience and with program continuity, but he proved with the 2012 National Championship and four Final Fours in five years that if you recruit the best players, challenge them in practice, and preach selflessness and defense, you can win. Mike Krzyzewski noticed and Duke jumped on board. Roy Williams also has a slew of McDonald’s All-Americans, and Bill Self has never shied away from recruiting one-year talents regardless of whether he plays them. UCLA this season joined the party with a pair of freshman All-Americans in Lonzo Ball and TJ Leaf. So far, Steve Alford‘s accumulation of talent has helped transform a formerly teetering program into the current #2 team in the country. Conventional wisdom once held that experience trumps talent in the NCAA Tournament. This was the rationale for the VCUs, Butlers and Wichita States of the game. But as major programs blend experienced returnees with those talented NBA prospects, they often overwhelm their less athletic, overachieving rivals. So, does this early trend hold? That remains to be seen. Perhaps those talented freshmen will revert to traditional norms or hit the rookie wall as the long season works its way into spring. Or perhaps injuries will take a toll. Or maybe some of those power programs in smaller conferences will again crash the party. It wouldn’t be a shock. But so far this season, it’s been a feast for the rich. How fat they get we shall know in good time. CBS Sports Top 50 Point Guards: Who in the Pac-12 Was Snubbed? Earlier in the week, CBS Sports released a list of its top 50 point guards in the nation. Three Pac-12 players made the list with UCLA’s Kyle Anderson checking in at No. 6, Arizona’s Mark Lyons at No. 11, and Stanford’s Chasson Randle at No. 29. While this writer can’t claim to have watched all of the other 47 guys enough to discredit their merits, a case can be made for a few other Pac-12 guys, in particular Cal’s Justin Cobbs and Washington’s Abdul Gaddy, as addenda to this list. Abdul Gaddy (# 10) has come a long way from his freshman year. Statistics aren’t the only indicator of how good a player is, nor are they the most reliable factor to make such determinations, but arguably the most important one to look at with respect to point guards is assist-to-turnover ratio. Neither Cobbs nor Gaddy were the sole ball-handlers for the Golden Bears or Huskies last year, but they were the top two in the conference (Cobbs first, Gaddy second) in that statistic and 25th and 26th nationally, well within that top-50 range. And, not that this is the best way of going about things, but for one comparison, Jake Odum (No. 49 on the list) finished last year at 179th in assist-to-turnover ratio with a lower assist average than either Cobbs or Gaddy and a scoring average that split the two (though Odum had more steals than the two combined). Handicapping Lillard’s NBA Chances: How Have Prospects From Mid-Majors Fared in the Pros? Looking at the upcoming NBA Draft’s projected lottery picks, most of the players represent the big boys around the nation – Duke, North Carolina, Kentucky, Kansas, Florida, Connecticut. But smack in the middle between guys that played in a Final Four is a kid from Weber State. Anybody who follows college hoops or draft scouting surely knows about Damian Lillard, but it’s still surprising to see a player ranked so highly who most fans have never seen play a minute of college basketball. 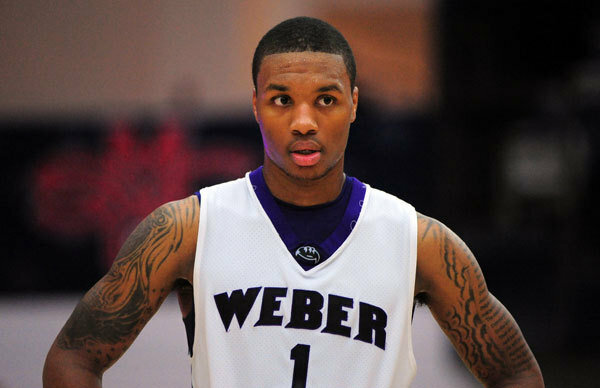 Will Lillard, who is projected to go in the top 10 as the draft’s top point guard, struggle to adapt to the massive increase in competition from the Big Sky Conference to the NBA? We researched lottery picks over the past 15 years from mid-major conferences to judge how successful they were in their transition to the league, grading success based on extended NBA productivity in the form of minutes played and value added. We considered all conferences outside of the top six power leagues as ‘mid-majors,’ so even the Atlantic 10, Conference USA and Mountain West qualify for our criteria. Taking a look at recent history, names like Jimmer Fredette and Stephen Curry came from smaller schools yet were still some of the most popular collegiate players in the nation. Just because a player hails from a mid-major school doesn’t necessarily mean he was an unheralded prospect. Nonetheless, the point of our analysis is to determine what, if any, crutch comes along with stepping up from such a wide gap in competition for lottery picks. Even though Fredette was a National Player of the Year winner, he still faced relatively weaker competition on a nightly basis at BYU. Is it more difficult to scout and project success for a mid-major prospect? Let’s take a look at how these players have fared historically. You’ll notice a trend that suggests Lillard should have a great chance at NBA success. Height/Weight: 6’2” / 180 lbs. Overview: Marquis Teague struggled with his decision-making for some of his freshman season, but he came on strong during the latter stage of the year to lead Kentucky to a National Championship as the team’s steady point guard. His greatest attribute is his blazing speed with the ball and an overall impressive set of physical tools for a point guard. The Wildcats really had no backup at the point, so Teague led UK in minutes played (32.6 MPG) while admirably handling the many responsibilities given to him on a team with several stars. Though turnovers were his biggest issue (2.7 TO per game), he also averaged 4.8 APG and made obvious improvements throughout the season in terms of his decisions. He had five or more turnovers in five of his first 25 games, but not once in any of his final (and more important) 15. Teague was really the Wildcats’ fifth offensive option on the floor, though he still contributed a solid 10.0 PPG through an array of drives and jumpers. 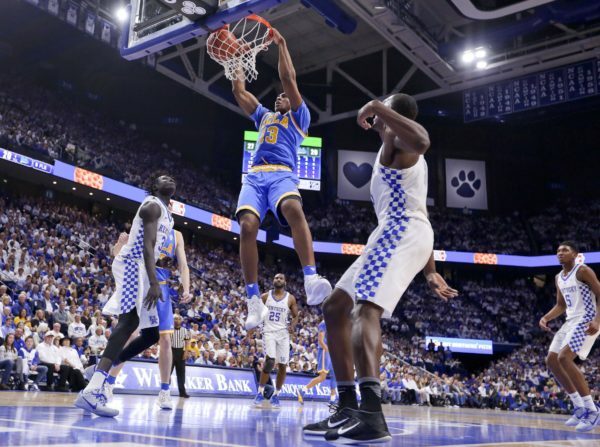 He thrives in the open floor and also does well in isolation situations, which he displayed in the National Title game against Kansas by getting to the basket for several layups in the half court. His shot is a work in progress, proven by his shooting percentages — 41.2% from the field, 32.5% from three, and 71.4% from the line. He wasn’t a game-changing defender as a rookie and only averaged 0.9 steals, but his physical traits suggest he should become a solid perimeter defender. Though very raw in many aspects, Teague appears to be in a dead heat with Kendall Marshall and Tony Wroten as the second point guard to come off the board on draft night.